This is actually the first zombie story I’ve ever read in my life and I have to say it was…interesting. In a very neutral way, I might add. Again, this is yet another dystopian novel. Seriously, I have no idea why I am so attracted to these. Then again, maybe it’s just a trend going on in the writing world right now. There isn’t really too much to the story—at least I didn’t think so anyway—yet I still managed to read the entire book in one sitting. I felt the ending was a bit anti-climactic, but at the same time I can’t say what it exactly it is I was looking for in the ending. The story itself is pretty straightforward. It’s a romance, albeit an off-beat one. I’m not sure if this would appeal to readers who love vampire romances, but I suppose it could. It’s a relatively light read—only 239 pages in the softcover standard print version. It’s good if you’re looking for something quirky and quick. I thought the author could have provided the answers to a few questions that could have made the story a tad better, but perhaps readers were only meant to focus on just the romance panning out and none of the in-between. Personally, I would have liked to know what exactly the “Boney’s” were, how they came about, and what exactly was the “disease” that spread and how that all started. Other than that, I really liked the characters in this one. I think my favorite character might have been M, R’s “best friend.” He didn’t have a lot of lines, but when he did show up, I found him to be pretty hilarious. I don’t know how the movie is, but perhaps it expands on where I thought the book was lacking in detail. If you’ve seen it, feel free to sound off in the comments below. And if you’ve reviewed it, please also feel free to include a link to your post as well. I saw the movie Rae. You can search it on my blog. Appears the movie and the book don’t explain the boneys well. The movie is not horror at all; rather its a rom-com with pretty cute / handsome people in more makeup than Nicky Minage (which is just a dash more). I’ll check that review out in a little bit. Doesn’t the movie contain like a lot of skeletons, rotting corpses, and violence though? Haha, all stuff I can’t stomach except in word form. The bad zombies arent that scary, they’re more Thriller type zombies, even the Boneys are very CGI obvious types. As the zombies become docile I didn’t buy it. Its a neutered zombie film. Lol…I’m not sure if I’m completely convinced to watch it myself. Do you have a link to your review, by the way? I typed it in to the search bar in your site and nothing came up for it. 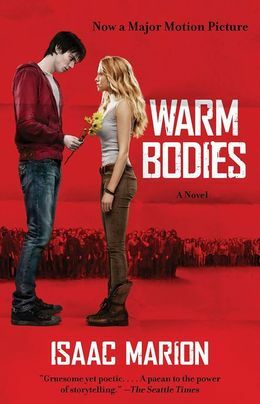 I’m not much of a zombie genre fan, so I’m afraid this book and the movie don’t really appeal to me. I might rent the movie though at some point, but in a huge rush to see it, ahah. Haha. Yeah, it was interesting, to say the least. I’m not very into zombies either, but this seemed different, so I thought it was worth looking into. Hey Rae, I’ve yet to read the book but the film was really good. M, played by Rob Corddry was funny, and the main characters, Nicholas Hoult and Teresa Palmer did a great job as well. Funny thing. I did a review on it and it ended up being read by Teresa Palmer who said she liked it. I embedded her tweet into the bottom of my post (http://erickochliving.blogspot.com/2013/02/a-warm-bodies-extravaganza.html). Teresa has a pretty cool blog that I follow on Zen living (www.yourzenlife.com). This was a fun movie to watch, and certainly was quite original. Must have made your day though that she noticed. Oh man, I need to check on that. I’ve been getting a lot of spam comments lately so I had to add a filter. I’ll have to go back in and test it out. Thanks for trying to comment though. Haha, I hear you. One of these days I’m going to write up an entry mocking spam and showcasing some of the crazy spam comments I get. Ever since I started using WordPress, I’ve discovered that some spam bots have nasty attitudes too.